Dhaka, Sep 9 (Just News): A group of parents and guardians today demanded the release of their children who, they alleged, were picked up by law enforcers in Dhaka’s Mohakhali and Tejgaon areas on September 5. If the students are guilty then the parents and guardian requested the law enforcers to produce them before a court. A total of 12 students were picked up by policemen from three spate messes in the two areas during a drive, the relatives of the students told journalists at a press briefing held at Crime Reporters’ Association of Bangladesh (CRAB) in the capital. According to the family's statement at the programme, the detained students are: Al Amin, Jahirul Islam Hasib, Mujahidul Islam, Jahangir Alam, Saifullah Bin Mansur, Gazi M Borhan Uddin, Tarek Aziz, Mahfuz, Raihanul Abedin, Iftekhar Alam, Tarek Aziz and Mehedi Hasan Rajib. Law enforcers were supposed to produce the students before a court on September 7 but police did not do so till today, the family members alleged. 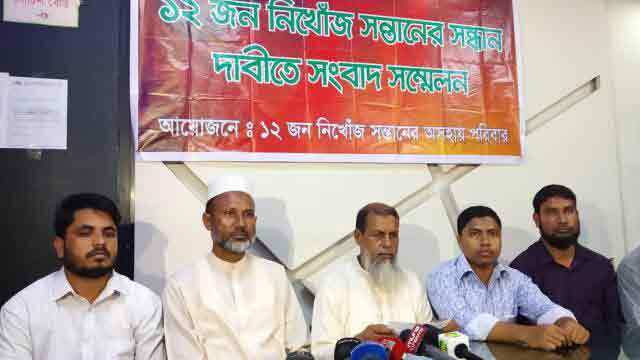 Mansur Rahman, father of one of the detained students Saifullah Bin Mansur, alleged that a police team launched a drive in Dhaka’s Mohakhali and Tejgaon areas on September 5 and detained the several students including the 12. Of the detainees, some students, including one named Sifat, were released from the office of Detective Branch (DB) of police but the rest 12 students were not released from the DB custody, said Mansur. The arrestees were tortured in the DB office, Mansur quoted Sifat as saying. “We are deeply concerned about it as the law enforcers deny the arrests,” he said. The families also urged human rights organigations, including National Human Rights Commission (NHRC) to raise their voices over the incident. When contacted, DB Additional Commissioner Abdul Baten did not receive phone.